In a strange turn of events -- but one that, gratefully, ended without incident -- retired Archbishop Patrick Flores of San Antonio became disoriented during an afternoon drive earlier this week and went missing. Fourteen hours later, Flores -- the spiritual father of Hispanic Catholicism in the States -- was discovered 200 miles away, driving the wrong way down a road. [T]he nation's first Mexican American bishop had been missing from his Lincoln Heights retirement home since about 2 p.m. Tuesday. Current Archbishop José Gomez reported him missing directly to Police Chief William McManus at around 8 p.m., and said he was "very concerned" about Flores' disappearance. At around 4 a.m. Wednesday, troopers with the Texas Department of Public Safety recognized Flores' car from statewide alerts. The archbishop, who is 78 years old, was looking "very confused, very disoriented," diocese spokesman Deacon Pat Rogers said. lores, who retired in early 2005, was last seen at his retirement community in the 100 block of Peter Baque, when nurses said they gave him some medication. It is not unusual for him to take short drives around the area, either to the H-E-B on Basse Road, to his bank, or to visit friends who live close by, Rogers said earlier Wednesday. "But if he goes somewhere, he's always back before dark," Rogers said earlier. "He was not comfortable driving at night. People knew if you invited Archbishop Flores somewhere, you had to feed him early, because he was leaving early. That was not out of the ordinary. This is out of the ordinary." For longer trips, Rogers said Flores uses a driver. The archbishop is hard of hearing and suffers from diabetes, Rogers and Gomez said. He was scheduled to take his regular diabetes medication at 4 p.m. but never took it. He has not been known to suffer from Alzheimer's, they said. 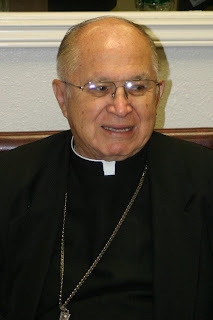 In 1979, John Paul II named Flores -- a former San Antone auxiliary then serving as bishop of El Paso -- to the archbishopric after a massive public outpouring (on a level unknown before or since) pushed for his appointment. It didn't hurt that when outgoing Archbishop Francis Furey sent in his consultatory terna, legend says he placed the name of "Patricio Fernández Flores" first. And second. And third. Though Flores retired in late 2004, the tributes continue still. In August, Gomez opened a new wing named for his predecessor to accommodate the mad rush on the archdiocese's flourishing Assumption Seminary. The first American seminary to mandate fluency in Spanish as a prerequisite for ordination (a policy instituted way back in 1911), Assumption's student body has nearly tripled in size over the last seven years. And in February, PBS' Frontline will air "A Migrant's Masterpiece," a documentary on Flores' life and ministry. Three years ago this month, transition morning in San Antonio opened a new chapter in Texas' ecclesiastical history, the effects of which reached their climax only in recent weeks. As Gomez was named to succeed Flores, what had been the global church's largest metropolitan turf was divided, with Galveston-Houston designated the hub of the US' first new province since 1980. Of course, the latter's emergence has since gone global with Dan DiNardo's elevation to the college of cardinals late last month... and not even three weeks after the consistory in Rome gave Texas and the American South its first red hat, its wearer is already making his newfound clout felt. At a "private" congratulatory lunch (video report) earlier this week with Texas Gov. Rick Perry (and 400 others, not counting the press corps), DiNardo pushed for movement on the Texas bishops' top concern for the last quarter-century: immigration reform. [The cardinal] said that an immigration policy focusing solely on punishing workers who came to the United States illegally is destined to fail. DiNardo, a first-generation American, said he and the state's Catholic bishops have for three decades supported comprehensive immigration reform with an emphasis on family reunification. "Certainly we want to protect our borders," he said. "At the same time, punitive measures alone are going to be ultimately ineffective, and I think counterproductive. "Most of the immigrants who come here really want to work and be part of our country." He said the issues he personally cares about — immigration, education, health care, abortion and the death penalty — don't fit neatly into an agenda of the political right or left. DiNardo expressed support for the Children's Health Insurance Program and government-funded vouchers for students attending private and Catholic schools. DiNardo told reporters that Texas and the southern United States have "never been known as an intensely Catholic area," but is rising in influence with the church. That comes from growth through people moving from northern states as well as immigrants from Latin American and Pacific Rim countries, he said. "I'm the result of an Irish mother and an Italian father," DiNardo said. "That's a volatile but a very rich mixture. I think in the same way some of the mixtures that have happened in the South have made it a very dynamic presence in the Catholic Church." As no less than B16 put it: "Texas needed a cardinal."